Instructor evaluator Rich Walker attempts to answer the question, “why is Fundamentals GUE’s most popular diving course?” Along the way, he clarifies some of the myths and misconceptions about GUE training. Hint: there is no Kool-Aid. For the first 10 years of my diving, I was a recreational diver. I dived on most weekends and had a great time. However, there was something in the back of my mind that wasn’t quite right. My training had been good, and I was a safe diver, but I was looking for more. There was a gap between where I was, and where I wanted to be. I read magazine articles about amazing wreck diving projects—things that really excited me. But I could not see how I could get to those projects. I tried different training courses and talking to people on the projects, but none of that made it possible for me to participate. It was probably because project managers don’t want unknown divers on their team. New members can be a risk. As somebody that now runs my own projects, I completely understand that mentality. I started to look for training that was delivered by active exploration divers and was designed to develop a project diver. That’s when I found Global Underwater Explorers (GUE). GUE had divers that participated and contributed to projects around the world. They were active all over the world. When I heard that GUE had a training program, I had to look into it. To start training with GUE one must first take what is called a Fundamentals course. 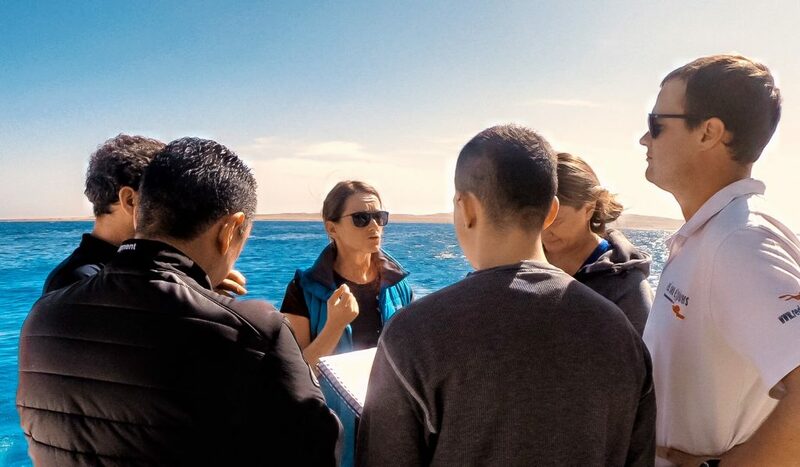 This course introduces already certified divers to the GUE configuration and GUE methods, and it makes sure that their basic skills are at the level needed to continue training. The most important component in any diving class is the diving. A GUE Fundamentals or “Fundies” class is the starting place for all of GUE’s technical diving courses and comprises at least six dives designed to challenge and refine your skills. It starts with a surprising element. 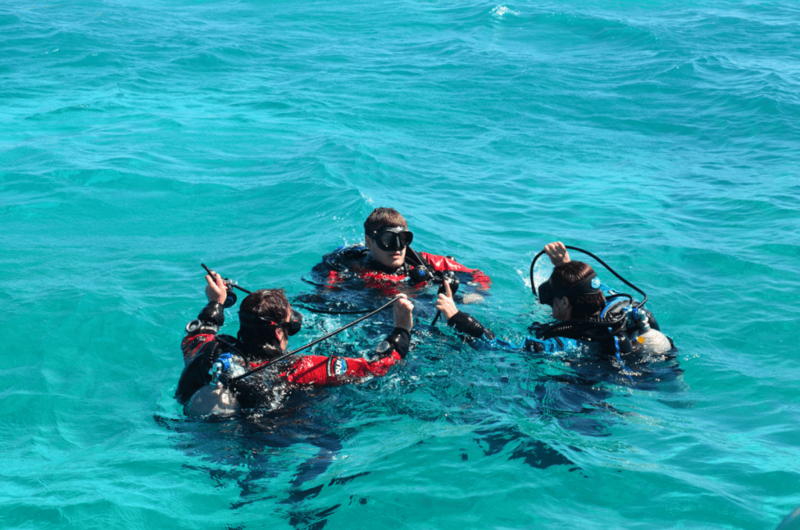 Proper neutral buoyancy and trim are the foundation of this course and the first thing the instructor will focus on. Most divers think they will have no trouble with this, but try it on your next dive. Get neutral and horizontal and then see if you can remain perfectly stationary. Do you track forwards, wave your hands, or have some other unwanted movement? GUE helps to teach the skills necessary to be able to achieve this. Propulsion techniques for greater efficiency and preserving visibility are the next skill the course focuses on, with advice to improve whatever your level currently is. Instructors often use video of your dives to help you see your progress. So whether you have had 20 dives or over 100, you will get something out of this. Dive two works on precision and control—the backwards kick, and how to adjust your position using the helicopter turn. This makes interacting with your team easier and enables stability for shooting photos, collecting samples, or making observations during a project easier. Without this precision, simple tasks take longer or can impact the environment and sometimes even your safety. Next, you’ll be ready to begin challenging your new stability. Regulator removals, exchanges, and mask clearing are part of this, but now you will be expected to do them while neutrally buoyant, in trim, and holding position relative to your team. Dives three and four introduce the valve drill and the s-drill. These skills work on important safety elements such as gas sharing and manipulation of cylinder valves, and they provide a perfect way to develop your new buoyancy, trim, and positioning capability while task loaded. Dives five and six introduce the surface marker buoy as a communication tool between the diver and the surface, and of course controlling an ascent while using one. Managing an unconscious diver, a no-mask swim in touch contact with your team, plus any skills that need more refinement to complete the class are also done during dives five and six. 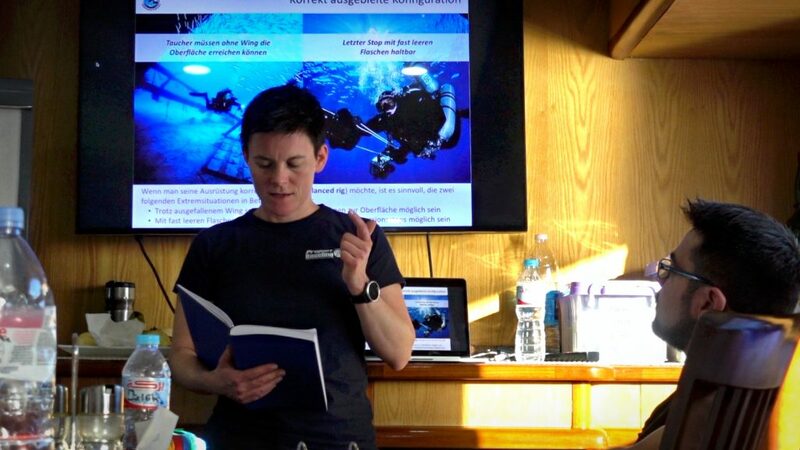 There are classroom sessions designed to explain gas management, nitrox, and decompression strategies for recreational diving. There are field drills for practicing the elusive backwards and helicopter kicks, as well as sequence and team-based skills like valve drills and s-drills. Field drills allow you to learn the steps of a skill without the complication of being underwater. You get instant feedback, making your performance in the water significantly higher. It’s a packed few days by any standard, but your instructor will support you all the way, giving you honest feedback combined with realistic suggestions for you to improve. “Go away and practice more” without explaining exactly what you need to change, and why, is not acceptable feedback. 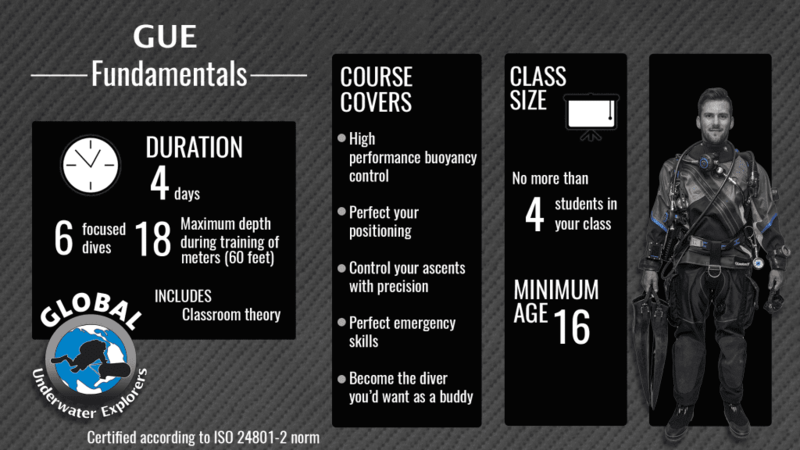 Even if you’re a rebreather or sidemount diver, the GUE Fundamentals class will still make you a better diver. You can take the class in either a single or doubles backmount configuration. The course can be taken in one or two parts depending on the students’ preference. Now, let’s address some common misconceptions about the GUE course. She took the Fundamentals class, GUE’s most popular course. It’s a four-day event, but your instructor can deliver it in two parts if prefered. “I wasn’t sure what to expect. My previous training had left me thinking that all I had to do was complete the tasks, and I would pass. With GUE, I found that there was always an improvement I could make on every skill. Every dive was an opportunity to improve. All of my debriefs included specific solutions for improving, not just ‘go away and practice.’ I discovered that whatever my starting level was, there was always a way to get better. For an experienced diver, it might seem that taking a step back to look at some very basic skills like buoyancy and trim would be unnecessary. Surely you would expect a technical diver or instructor to perform any skill whilst maintaining their position in the water, wouldn’t you? Sadly, that isn’t always the case. Sometimes it’s worthwhile to go back to basics and have a closer look at the things you think you know. “After about a year of exclusively backmount diving, I still felt there was room for improvement in my skill set and comfort level. The GUE Fundamentals class seemed a logical choice,” Gibson said. GUE divers think they’re better than everyone else. Some say that GUE divers are elitist and consider themselves better than other divers. It’s easy to understand how that perception would exist. GUE divers often try to explain how we dive, as well as why we don’t do certain things that are common within the sport. Sometimes this comes across wrong. “I never felt any elitism or superiority from any of the GUE members. The one thing I have noticed is a humble and simple approach to excellence,” said Luke Inman, who is a photographer/filmmaker and PADI course director explained. Inman recently took a GUE Fundamentals course. Much of this perception of superiority comes from internet exchanges, which mask the true tone of a conversation. It’s always better to communicate in person! “What finally pushed me to sign up for the class was the people. I have had the opportunity to dive with quite a few GUE trained divers over the past several years and they have all been exceptional buddies and divers,” Gibson said. But I only dive sidemount or rebreather. Why should I take a “basic skills course”? The basics of buoyancy, trim, and propulsion are universal—even with a rebreather! The GUE approach to teamwork is universal. The simple and logical approach to emergency procedures can also be mapped back to any other configuration. For an experienced diver, learning GUE procedures would be a highly useful exercise. “GUE shows how something sophisticated in theory can be simple in application,” Inman said. It’s a cult. They will fill my head with nonsense. Believe it or not, people hear that GUE teaches dangerous practices, removes your ability to think independently, and turns you into a robot. Sadly, the individuals passing along these rumors have rarely taken any training with GUE. “Some of my best dive buddies had taken the class long after starting cave training and said it was challenging and beneficial to their diving level,” Gibson said. A GUE instructor will take pride in explaining the logic and reason behind every piece of advice that they give. There is no “Kool-Aid” in a GUE course. GUE instructors present information, logic, and solutions. My experience is not recognized! 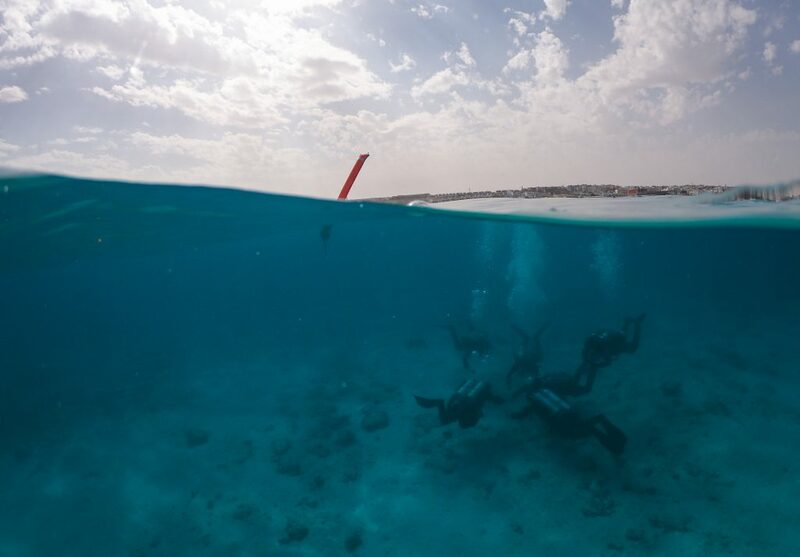 Predive checks with teammates before descending in the Red Sea. Photo Courtesy of GUE. When I went to Florida for my first cave class, I chose GUE for two reasons. Firstly, I’d experienced a range of instructors and wondered if this would be different. I was an instructor with several organizations and was curious to see their approach. Secondly, I’d researched my instructor and decided that his background in exploration would mean that I would gain knowledge from an active explorer, which is what I had been searching for. By the end of the class, my world had changed forever. I stopped teaching technical diving until I could dive like my GUE instructor. A year later, I started GUE instructor training, and the rest is history. I’m now a full-time instructor, only delivering the GUE curriculum. My story is not unique. Luke Inman, whose quotes have been sprinkled through this article, has recently decided to become a GUE instructor. “I remember taking a Full Cave course in Mexico and noticing that the GUE classes had a simple and distinct difference from the other agency’s courses. It is far more difficult to identify a GUE instructor and differentiate them from their students. Simply because the student standard is so high. The excellence shines through,” he said. Before people have passed through their GUE training, they look at diving in a different way. They often have some very common worries when starting out. But after the class, these worries turn into an appreciation of the GUE system. From the least experienced diver to seasoned professionals, divers taking GUE training talk about real improvements in their comfort and capacity. Many of these divers join projects around the world. They bridge that gap between reading about exciting and important diving projects and being an active part of the story! If you’re open to learning new skills, want to find out about GUE for yourself, or are ready to get started on your route to project diving, then talk to your nearest GUE instructor. They’ll meet with you for a chat and give you some honest advice. If you talk to me, I’ll get in the water with you for a quick dive, no strings attached, and show you what it’s all about. I know most GUE instructors will offer this service too. It depends on where you want to be diving a year from now! To find a GUE Instructor near you. Rich Walker learned to dive in 1991 in the English Channel and soon developed a love for wreck diving. The UK coastline has tens of thousands of wrecks to explore, from shallow through to deep technical dives. He became aware of GUE in the late 1990’s as his diving progressed more into the technical realm, and he eventually took cave training with GUE in 2003. His path was then set, and he began teaching for GUE in 2004. Mars project, Sweden; Cave exploration team in Izvor Licanke, Croatia. ; Ghost Fishing UK, Chairman and founder. He is a full time technical instructor and instructor evaluator with GUE, which he delivers via his company Wreck and Cave Ltd. He sits on the BoD of GUE and several other industry bodies.